A folding electric bike is the ultimate companion for a fast and convenient commute. Not only do you get all the benefits of a power-assisted ride, a folding bike can also be easily stowed away in the boot of your car and unlike normal bikes is also permitted on most public transport. Electric bikes, otherwise known as eBikes, look very similar to your normal bicycle but they have one fundamental difference: a battery which provides power-assisted travel. By utilising lightweight and powerful lithium ion batteries, similar to those seen in laptops and mobile phones, eBikes can be charged up and used to run a compact electric motor, which is usually built into the hub of the back of the bike or the front wheel area. In general, electric bikes are capable of reaching speeds between 10 to 20 miles per hour and can run for anywhere between 10 to 80 miles between charges, depending on the power of the battery and the amount of pedaling you contribute during the ride. They provide environmentally friendly transportation with all the convenience of driving a car and zero of the emissions – and even better, you can bypass the traffic. Pedal-assisted eBikes are the bicycle equivalent to hybrid cars, where an electric motor can kick in to give you an extra push when pedaling gets too much. 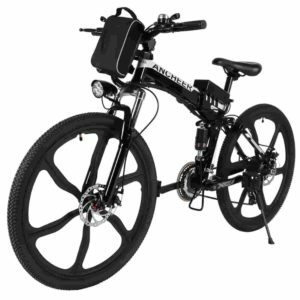 Whilst most electric bikes are far heavier and more cumbersome than a normal push bike, folding eBikes offer the best of both worlds by providing a solution that is transportable and compact. Here’s a look at the best folding electric bikes on the market right now. Electric power headlight keeps you safe in times of low visibility without any need to worry about changing the battery. Easy folding system features a folding handlebar stem and lightweight aluminium frame for simple transport and storage. Adjustable handlebars mean this bike can be customised to your height, allowing for a comfortable, upright ride. 48v lithium cell battery provides lightweight power with 7 speed options. LCD display with USB port for simple device charging. One charge provides up to 88km of power assisted travel. The Addmotor MOTAN is an excellent option if you’re looking for a convenient and powerful folding eBike. With a battery that can last up to 88km, or 54 miles, you can go far with just one charge. The charge time of 3-4 hours is relatively low for the power output, meaning you can charge up easily whilst you’re at work or in a meeting. Whilst some folding bikes can be less comfortable than a standard bike, the adjustable features on this model make for a relaxed and customizable ride. Travel up to 31 miles from one charge on power assisted mode with 36v Li-Ion battery. LED headlight and built-in horn allow for safe and visible cycling at night. 21-speed Shimano transmission system and 3-speed smart button make it easy to travel up hill. Easy to witch between eBike and assisted cycling mode. Slip-resistant 26 inch aluminium alloy wheels. 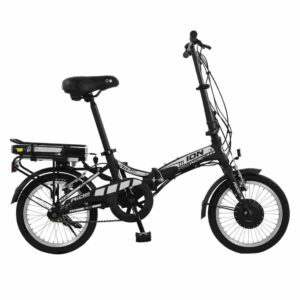 At the price, the NCM Moscow eBike is an absolute steal. 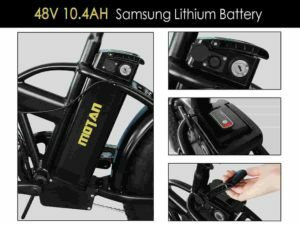 Although it does not quite match up to the spec of the Addmotor MOTAN, it can travel a very respectable distance on one charge. The charge time is quite a bit higher, but this is a small compromise considering the difference in price. Lightweight aluminium frame with easy folding mechanism. Powerful alloy brakes with auto motor cut out brake levers make for a safe ride. 36v Lithium ion battery allows travel up to 55km on one charge. Alloy rear pannier pack allows you to carry luggage easily. Coming in at an even lower price than the NCM Moscow eBike, the Ion eBike by Ride is a great option for those on a budget. With plenty of great features, this neat little bike is more than adequate for most uses, and is lightweight and durable making it perfect for commuting. The Addmotor MOTAN is the most powerful eBike on this list, so for those with a higher budget who are looking to travel longer distances this is the best choice. 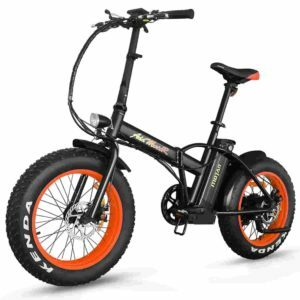 However, both the NCM Moscow eBike and Ion eBike are excellent alternatives for those on a lower budget who only need their eBike for lighter use. Overall, the Ion eBike provides the best value for money and as the most lightweight option on the list, it is a great choice for commuters. Whichever model you go for, you’ll certainly appreciate the convenience a folding bike brings to the table.